I finally got the time to edit the pictures from Niece #2 wedding. Here is the picture during the akad nikah ceremony in the mosque. 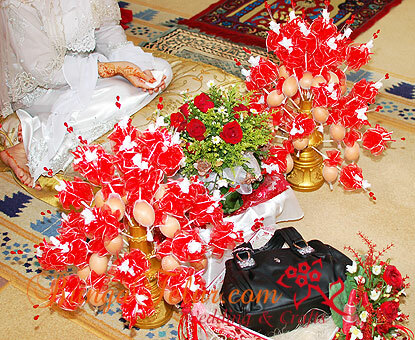 The groom side brought along their gubahan hantaran which were done in red as well. Usually the bride and groom will choose different color theme but this time I don’t know why they decided to use one color theme..huhu! The cake for potong kek ceremony after makan beradap. 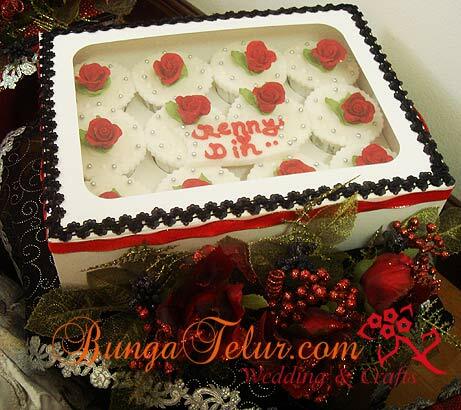 I ordered the buttercream cake with gumpaste floral decoration from Citra Klasik Bakery. The owner, Kak pau was very understanding and easy to communicate with. I did all the order online and via phone, and the cake was delivered just on time. 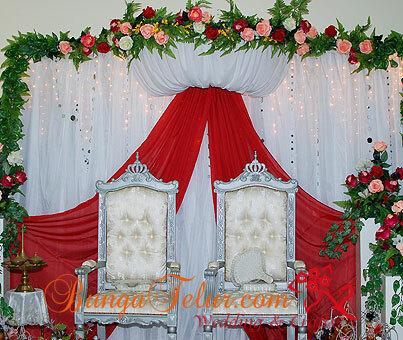 The pelamin came together with the bridal outfits rental. Niece #2 and her husband did all the booking. I think the pelamin biz is somewhere from Gombak area. The bilik pengantin was done by SIL and her daughter #1. They used the bedsheet bought for Niece #1 wedding. I bought the bed runner at the bazaar in The Curve. The rose petals and candles were bought at IKEA. Overall despite a few glitches here and there, the red wedding went smoothly. Selamat Pengantin Baru to Niece #2 and her Hubby! The plastic containers initially planned to be put bunga rampai has been substituted with tiny chocolate pieces. The chocolate cupcakes were ordered from Citra Klasik bakery. 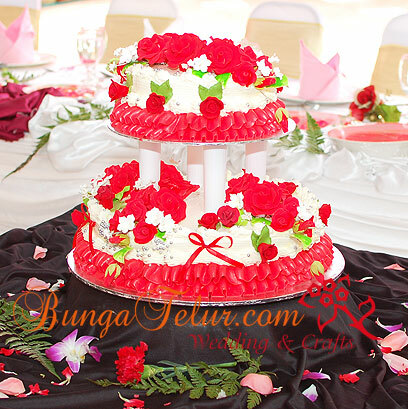 They were decorated with white fondant, embellished with red roses. I purposely asked them not to wrap the window white box with ribbon since we wanted to decorate the box with the same materials used in other gubahan hantaran. SIL couldn’t find deep red apples such as Washington or dark red grapes. She bought cherries, plums and Fuji apples instead. 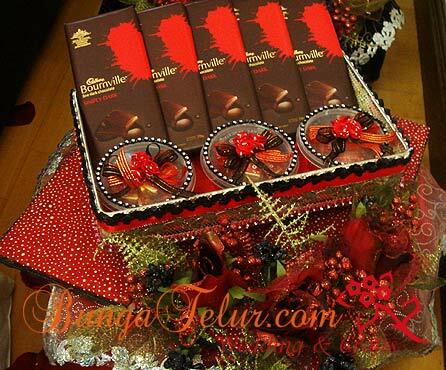 Oh, not to forget strawberries to give some color contrast to all the deep red tone among the fruits..heh! 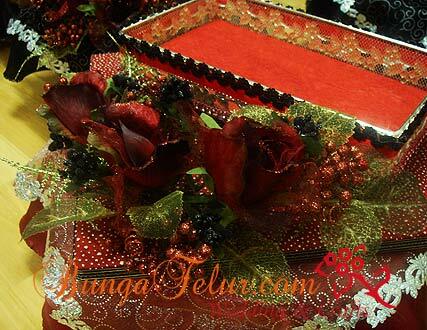 Personally I was happy with the outcome of the gubahan hantaran for this red and black wedding. Congrats to Niece #1 and SIL for doing a good job in decorating all the hantaran. Niece #2 is getting married this weekend and her wedding theme color is black and red. Personally I am not really fond of having black as part of the gubahan hantaran, but since merah hitam is like the current trend, so here is what the family has done for the bride’s side of the hantaran. At first I thought I will make bunga dulang from dip. But since I couldn’t find ample time to do so, we resorted to buy artificial ready made bunga dulang from Fah Lean. I added some putik bunga in black which SIL bought in Nilai 3 to complement the red bunga dulang. The rectangle wire basket will be filled with fruits. 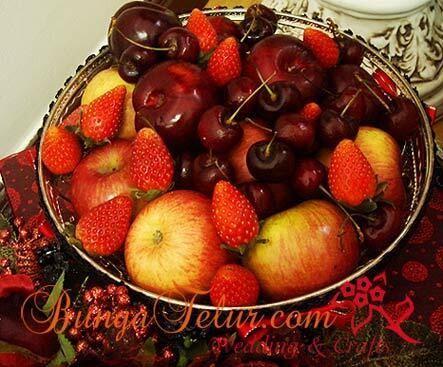 Suggested fruits could be red apples, plum and deep red grapes. SIL tried her hand in making folded rose from ribbon to embellish the plastic containers she plans to put bunga rampai in. I will update with more pictures of these hantaran merah hitam after the wedding is over this weekend.